This table is from the collection of Mary Lloyd Pearson. She loved to go to shows and she loved the country theme. She put together this table and I am selling it with all the things she had on it. 3" wide x 1 1/2" deep x 2 1/2" tall. 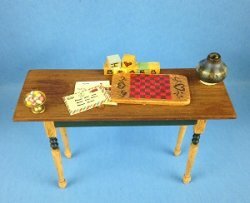 It is a painted wooden table with a checker board, blocks that spell "I love bears," letters, a vase, and a filled candy dish.